“You’re a bit of an artist I see, can’t give you a job at the moment as a set designer but if you’d like to be a cameraman for a while – same thing really, making pictures, we can probably let you have a go a designing sets later on”! Well that’s how it all started really in television for me, being “a bit of an artist”. 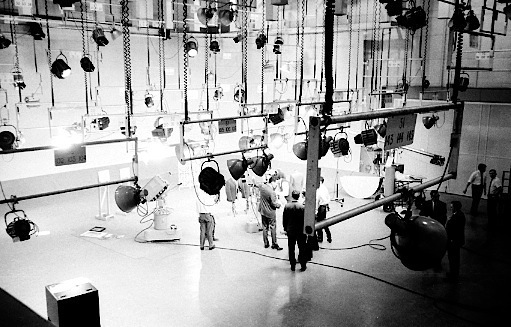 In early1963 Studio One had recently been commissioned – with a new cyclorama and ground-row and, a brand new technical toy, the “Vinten Camera Crane”. 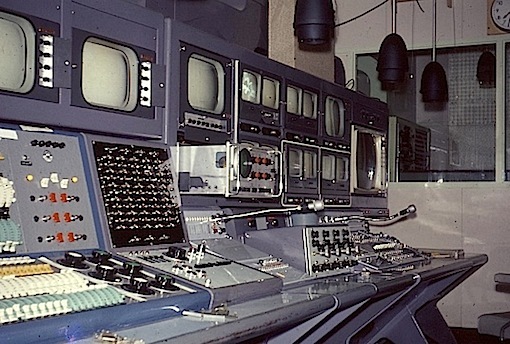 There were also other innovations to marvel at like Electronically Controlled Lighting Bars and new lightweight, plastic “cans” ( headsets) for the king-size PYE studio cameras. At that time I hadn’t an inkling what all this jargon actually meant but I learned quickly. You were thrown in the deep end in those days. 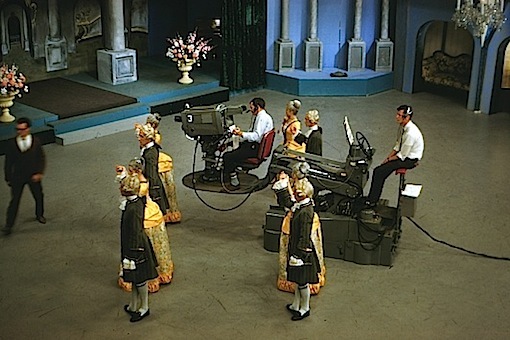 The studio camera-crew was Phil Booth, Alan Richards, & Russell Sage with a young Murray Kelso as a junior; I became the fourth cameraman with my baptism of fire on Camera 1. up on the mezzanine floor, for the production extravaganza “Invitation to the Dance”. I was so well trained by then that when Brian Williams, directing at the time, asked me, through my “cans”, to “rack to your 35mm lens Camera 1.” I had to run around the front of the camera to read what it said on the lenses! 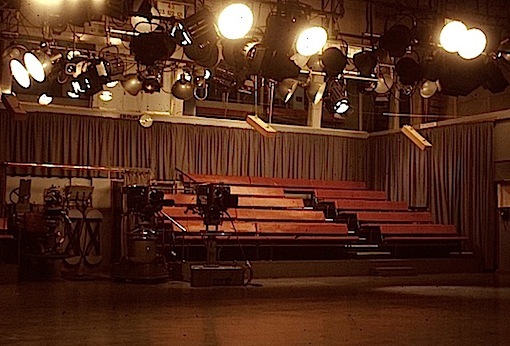 Studio One showing part of audience seating with mezzanine floor above the curtains on the right hand side. This ran the length of the studio and was above the audience entry passageway. The usual turret lens complement on a studio camera included, 35mm, 2 inch, 3 inch, 6 inch and a “long” 8 or 12 inch. Why only one was measured in metric was a puzzle? We did have a couple of mechanical zoom lenses. One, the Varatol, had a crank winder, and the other, I can’t remember the name, had a kind of “push-pull” and twist for focus, mechanism? 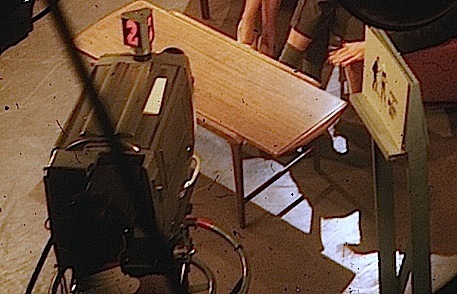 These “zooms” were generally used only on the smaller, older, PYE cameras, reserved by then, 1963, for Outside Broadcast programmes – we did lots of those! Weekend “World of Football”, I remember it well. 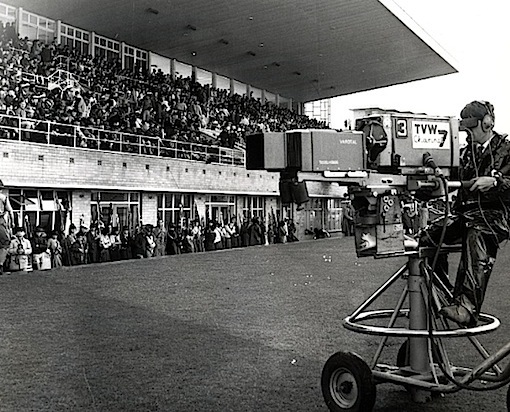 On one Grand Final Day we had the usual static camera positions around the ground plus the mobile “pram” with me sitting astride it. This was our “secret weapon”, our one-upmanship against the ABC and I think by then Channel nine OB crews. As the football teams lined up for the opening run out on to the field, three of our technical crew dragged me, on the pram and many metres of cable, out into the middle of the oval to get the “Entry of the Gladiators” shot from the front. We got it and we also appeared with our Channel Seven logos plainly visible, on the other stations opening pictures. They were outraged. We were still running and dragging the camera and pram off the pitch after the game had started! I think John O’Callaghan was the genius behind this escapade. There were many others. The Voyager Disaster, when a RAN cruiser was rammed by the aircraft carrier Melbourne made headlines around the world. Seven had an OB crew out at Perth air-port on the night that the WA survivors returned home. We had one camera set-up for interviews in the airport lobby and upstairs on the out-door balcony, Gary Carvolth and me, with my camera set-up on a static tri-pod, to show and comment on the plane landing and taxiing up to the terminal building. Just as the aircraft touched down the picture on my viewfinder packed up. All I had was two pin-points of light, the wing lights, to go by. We were on-air, live and Garry was a few metres from me looking at a monitor, so he had no idea that I had problems. I could just see the picture on his monitor (my picture) some two and a half metres to my right. OB monitors in those days were tiny and notoriously “snowy” and soft focus, plus Gary kept standing in front of it – speaking into a live microphone, so I couldn’t say a word. I was fully zoomed in using the previously mentioned, push-pull zoom lens! After an OB, I often smoked a couple of cigarettes in those days! 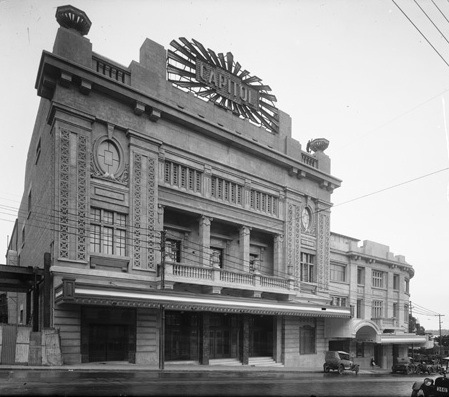 There were plenty of outside broadcasts that went off smoothly enough but one other that made headlines around Australia and well worth a mention here was the Normie Rowe Concert from the Capitol Theatre. Max Bostock has mentioned this in his entertaining, recently recorded video recollections with Richard Ashton and Gordon McColl. 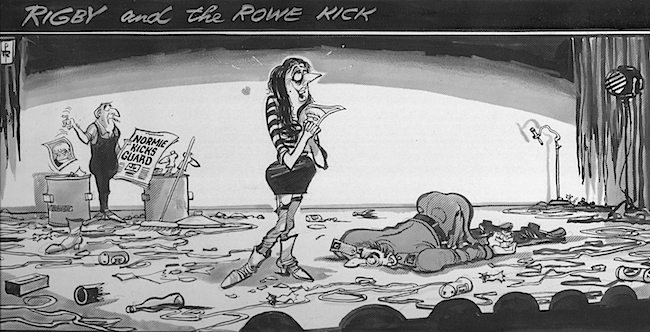 The public were getting used to a little “excitement” at Rock n Roll concerts by the mid 1960s but this was Perth where things didn’t usually get out of hand and, a private security company had been hired by the concert organisers just in case anything untoward did occur. As the concert progressed the audience left their seats and pressed hard up against the stage. What happened next is open to interpretation. I know what I saw but describing the specific incident in detail here, even after more than 30 years could be controversial and would serve no useful purpose. It’s enough to say something happened that triggered mayhem, and as the saying goes, “It was on for young and old” with girls climbing onto the stage two and three at a time. The security guards appeared to lose control of the stage completely, and, girls were literally thrown back out into the audience, (I’m not saying or even hinting at who was doing the throwing?) Everyone in the audience then left their seats, screaming and yelling as fights started in the auditorium – there were also punch-ups on the stage. Isn’t it wonderful he kicked me too! This incident and the negative publicity it generated inevitably lead to litigation, possibly between the concert organisers and the security company, though after more than 30 years I can’t be sure now who was suing whom? I believe the video recordings we did manage to get were used as evidence in court. 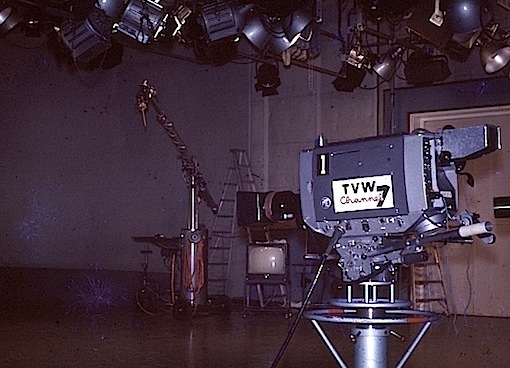 My first Set Design for the TVW was for one of the stations more extrovert producers, Mike Brand. He was making a musical insert for an Easter Special, for Coralie Condon’s morning show “Televisit”. We might have had a choir or perhaps it was a solo singing artist – can’t remember which now, but I do remember the set. It was a simple, cut-out “crown of thorns”, about two and a half metres in diameter hung on nylon thread in front of the cyclorama. Producer/Director/Studio Supervisor Mike Brand was a fitness and health fanatic with amazing strength. He was also a former wrestler and film industry pioneer who later became a restaurateur and actor. Soon after that, set design and painting became my priority occupation for a number of years. We did a lot of regular live programmes in those days – children’s shows, daytime “who’s of interest in town” ladies programmes. Richard Ashton’s “Today” with Lloyd Lawson interviewing invited, gloved and hatted lady guests, little fingers extended, at morning tea with cream buns. The floor-crew, begrudged every on-camera mouthful as it meant less cream buns for us once the programme was over. There was “Club Seventeen” on Saturday, World of Sport on Sunday, the regular live variety show “In Perth Tonight” on Monday, lots of sets and themes for this one. Plus the occasional extravaganzas like “The Good Oil”. 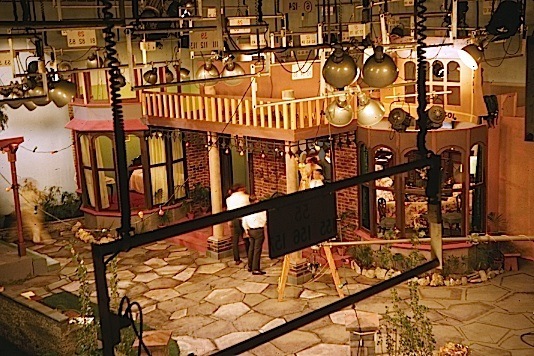 Studio sets for that show included the re creation both exterior and interior, of a part of the Perth Stock Exchange. When I went into the city to sketch and photograph the building it was daunting to see the scale…… the actual façade was several times the height of the roof of Studio One. We had to scale it down and make it possible to fly out when we needed to get to the interiors. In those early halcyon days of the sixties budgets for sets and costumes didn’t exist. Well perhaps they did really, but for some reason known only to “Supply”, the designer wasn’t allowed to know what it was. It became a game of, design the set, cost it, then cut it back by 25%. Cardboard, acrylic paint plus a few of lengths of Indonesian soft-wood, were cut, carved, folded, bent and slapped-on with paint-brush and roller to create Children’s Fantasy Worlds, Teenage Discos and anything in-between. For “posh” shows we might get to use a bit of ply-wood and the ever popular “glitter dust”. For the winter scene in the Nutcracker Suite ballet we used bags full of cigarette paper off-cuts for the snow, sprinkled down from several positions in the lighting grid. The effect was very realistic. A minor problem was that it continued to be realistic for months afterwards as the slightest draft from the air-conditioning would dislodge forgotten little snowflakes from the lighting bars, during commercial takes or other studio recording events, when snowfall was a tad inappropriate! Due to lack of funds for costumes the Channel Seven Dancers often performed in black leotards and tights. On several occasions after discussion with Kevin Johnston and Danni Harford I did my best for them by making something wearable out of light-weight corrugated card. One time we produced a ballet insert for “In Perth Tonight” using the BBC Radiophonic Workshop’s theme music from “Dr Who”. For the set we hired a number of 2 metre square cyclone-wire frames. The girls danced in the usual black leotards and tights wearing cardboard helmets I had made up that afternoon. The effect of the silver, tubular frames, the helmeted figures, and the clever choreography, against blacks, with oblique lighting, was surreal – and we did it all for a very few dollars. How the girls managed to see where they were going with those helmets on bless ‘em I’ll never know. Back row L to R: Jennifer Hayden, Karen Obbs, Danni Harford, Janet Ladner. Front row L to R: Adrienne O’Meara, Gay Chandler, Clarice Page. 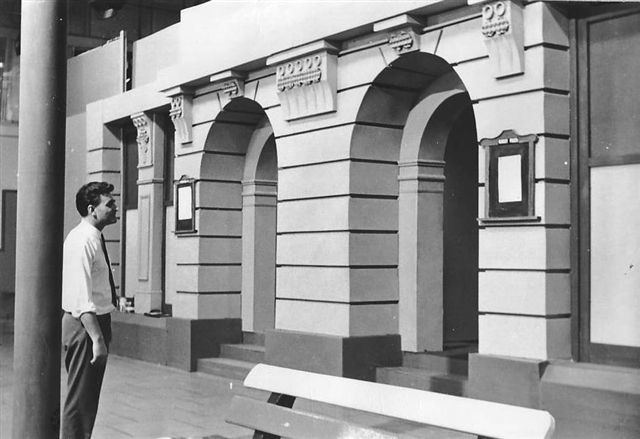 At about this time, Management, or perhaps more correctly the then “big boss” Jim Cruthers asked staff generally to come up with ideas for a revamp of the canteen. In those days it was quite small but there was opportunity to extend the eating area by taking out the existing wall on the right and making use of the space under the verandah. I did some perspective drawings showing how this could look and submitted them. Somebody up there liked what I’d done as a couple of weeks later I found myself in charge of the Graphics Department! 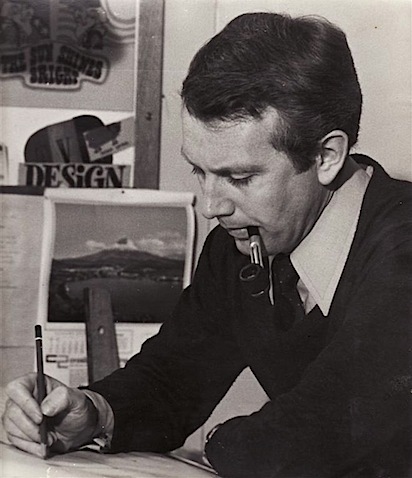 We had no Design Department as such in the 1960s, my desk and drawing board was more or less it. For a while I was squeezed into a corner of the production office. 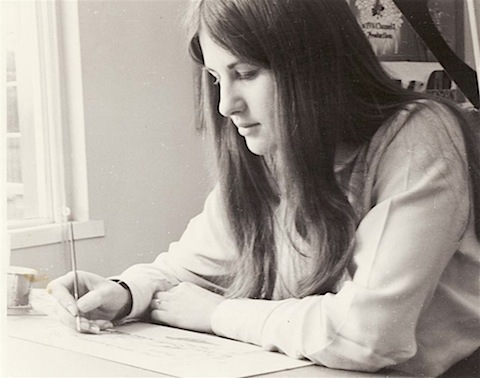 Later I shared the graphic art studio with Geoff Pratt and Sandra Lucas and shortly afterwards the new graphics artist, Helen Harrison. Graphics was then moved into a smaller room so I was back in the production office for a while. When the new more spacious Graphic Art Studio was commissioned I was back in with Geoff and Helen again, so when my promotion came I was no stranger to the workings of the Graphics Department. Computers in those days consisted of rooms full of mysterious technology, NASA had a few, and there might have been the odd one or two heavily guarded in the vaults of some of the bigger Australian banks. Computer graphics were still a long time into the future; we did almost everything by hand. The big innovation was Lettraset, letters on sheets that could be transferred onto artwork. These sheets were expensive so for news caption superimposition we used the “Hot Press Machine”. This contraption was the cutting edge, titling technology of the time! It looked like a combination of an over-sized toasted sandwich-maker and a one armed bandit. The process consisted of using a heated metal plate, brass type and, dry ink on a plastic backing. One would place a black caption-card on the sliding base-plate, cut off an appropriately sized strip of ink, set up the letters face down on the ink, slide the base-plate under the press, pull down hard on the lever lowering the heated top-plate, and bingo, one caption, ready for the news-cast. Fingers were often burned from lifting the hot type of the card too quickly. We had an interesting range of card colours: there was black and a more black black, grey and another darker grey and a light blue that broadcast as grey anyway, so I don’t remember why we had light blue? Lettraset came for television in black and white, hot press ink came in black and white, and our Tamma opaque paint came in black and white. Much of the work for the graphics designers consisted of white on black caption supers. These could be for programme credits, news captions or commercials. Our department in those days also produced a lot of illustrated programme promotion graphics. We would be given a list of scheduled films or drama series and little else other than a brief couple of lines of plot description. If we were lucky there might also be a couple of poor quality black and white promotional photos of the stars. Quite often there was nothing much at all so we had to try to come up with a background illustration based only on the title. Mostly in cases like this we erred on the side of safety by using just the title on a textured background, particularly when we were only given a half hour or so to knock something up. Some of these bland efforts attracted criticism but generally the standard of the work that came out of that studio was remarkable considering the time limitations. An example of the problems that can occur when the artist has only the title for a programme to work from, happened some years later when I was working at the ABC. A request came in for a promo graphic for a show entitled “The Primates” The artist, (not me thank goodness), hand-lettered the title together with a beautiful illustration of a family of monkeys. 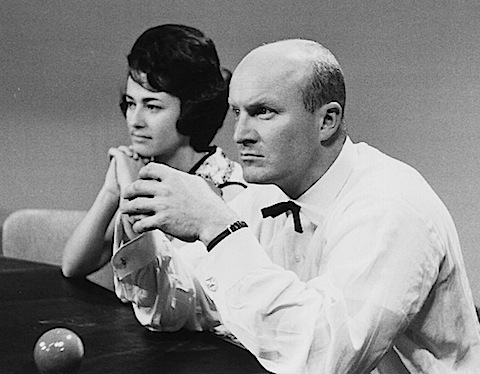 The show when it went to-air turned out to be a documentary on the Catholic Church. A number of the bigger advertising agencies employed their own graphics designers. The work they produced was more often than not of an excellent standard. We would run into problems when they used a wax based adhesive for attaching photographs to their caption cards. This kind of sticking agent was fine for newspaper advertising paste-ups but not suitable for television work under hot lights. Producing “graphics only” commercials could be done in two ways – the first and most expensive would involve a studio and a number of cameras shooting the graphics on graphic stands. The cheaper way was using the “caption scanners” in telecine. There were big problems here if the wax-type adhesive had been used for mounting photos. The scanners would get very hot and melt the wax and as the camera in the scanner sat below the artwork, the pictures would slowly peel off and land on the camera lens – not a good look for your commercial. Despite each agency and our sales staff being supplied with specifications for graphics produced off site, occasionally, we would still have work come in where the dreaded wax adhesive had been used. Though the artwork looking very professional we would have to reject it for use in the caption scanners and be forced to make the commercial in the studio, costing considerably more. There would be indignant backlash from clients to agencies – agencies to our sales staff – then inevitably, sales staff to the team in graphics. In the early days sometimes the clients themselves would insist on producing their own artwork! A certain electrical store in Subiaco came up with what they considered to be an outstanding selling gimmick, “Elmer the talking Elephant”. He was the creation of the then store owner, who like me was also “a bit of an artist”, or so he had been told by his family. His artwork was usually in pencil and crayons, painstakingly if rather unsteadily produced on cardboard from the inside of cornflakes packages. And we put them to air! The store owner would want to stand in the studio next to the graphics-stand, bouncing the graphic in time with Elmers voice on the pre-recorded audio. Animation he believed! The floor-manager did talk him out of that and Elmer eventually died of natural causes. In late 1970 Helen Harrison and I were married. We resigned from TVW in early 1971 to join a group of people travelling to Europe, overland by bus from Nepal. 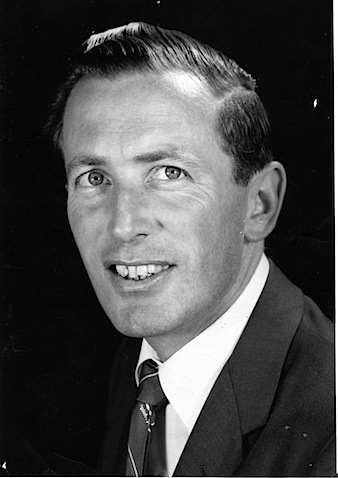 Though that was the beginning of another interesting phase in my life, I remember the eight years I spent working for TVW Channel Seven with great affection. We were a family, a band of brothers and sisters loyal to each other and learning in an exciting “hands on” way about an industry that was still in its infancy in Australia. Fortunately our viewing audience was also still learning and we got away with it. I often wonder whatever became of the “Channel Seven Workshop” members. They were a group of young talented singers+ dancers in the 1970s who were under the direction of Brian Smith. Some of the members were Rhonda Thunder (nee James) who married Tim Thunder, Coby Volleman and myself Jacqui Joseph.We always appeared on Telethon and other opening nights while we also made vocl recordings and back up for other artists. I was a member of the Workshop from the beginning. I was there for three years and married Marie Pubben. (Since divorced) I live in Seattle Washington where I have established a resonable reputation as an actor. Late last year I shot a promo/interactive web film for the new Sherlock Holmes movie. We need to get some pics up onto this site. Goodness, since the reunion all the old names are making contact! I still live in WA, but about 120klms south on a small property. Since the Workshop I have been employed in a variety of jobs and currently am the State Manager for an Australian Pharmaceutical Company. Maybe we could get some pictures up at some time. Oh my god Jacqui, I also often wonder whatever happened to veryone in channel 7 perth workshop of those early days. After marrying Paul (Went with ausie name marie in those days) but now go by mr prefered given dutch name of “maryke”. Have been yoga teacher for the past 10 years and love it. Have 35 year old daughter with ex hubbie (paul). Wish we could drag out some things from archives to show her….like opening of Concert Hall, Opening of The Sheriton Hotel which went live accross australia, and where is Brain Smith these days?? Last I heard he was living in sydney. I have seen sue ellen/carmel and Igor of late and all doing well. It would be a hoot to get some of us together for telethon….You can find me on line through Beacon Yoga Centre. Love to hear from you! Hi Just read the blog. 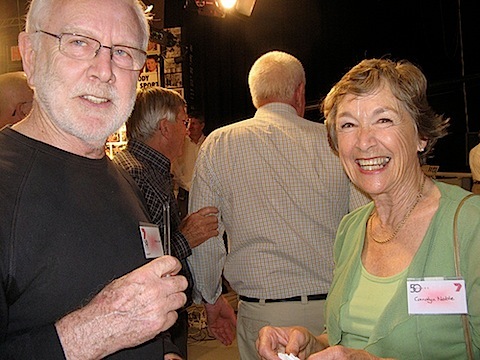 I too was an original 1971 member of the Channel 7 workshop and left at the end of the first year to go to Sydney. I remember Paul Eenhoorn’s name. I am still friends and in contact with Christine Vandersluys. Remember Ronni Johnson, Michelle Lee, Robert Deephouse, Corine Trckey & Michael Arrowsmith? I can remember doing a few of the Miss West Coast and Aust Beach girl shows at Beatty Park and one with Jill Perryman and Kamarl. Such a lifetime ago and all those nights at Channel 7 rehearsing with Brian Smith and George White. Let me know if you are able to contact the others. Hello all, Another long lost Workshop member here. I too was one of the original cast. Interesting times. I have a TV Times clipping showing all of us with Kamal. You can see the clipping in my Facebook album. After my Ch. 7 Workshop stint I sang around Perth for a while at the Ports of call, Casa Peppy, OBH hotel, a bunch of pubs, etc. Moved to the USA in 1978 after traveling overland for 6 months. Did some theater here in the States. But life in the business world won. Retired as CEO of my own Trade Show Exhibit/Museum building company. Still stay active in my own design business in the special event industry in Chicago. So happy to have stumbled on this site. Happy New Year to you all!! !